Baseball legend Dusty Baker teamed up with Master Winemaker Chik Brenneman to share their combined passion for excellence in creating a line of handcrafted, limited production wines. Starting out as a gentleman's vineyard in Dusty's backyard, the wine initially was given away to friends and family. After a consistent level of praise and acclaim for Dusty's 2012 Vintage Syrah, the duo decided to expand their production and to "go pro!" 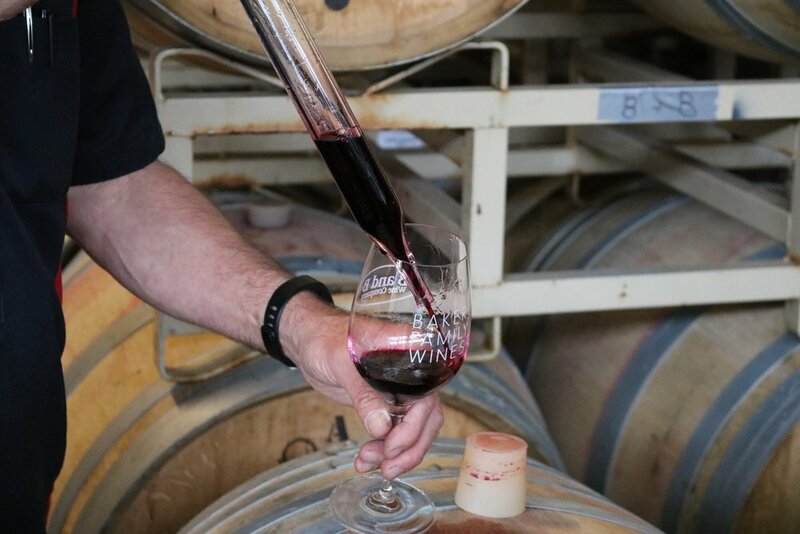 In 2013 Dusty and Chik established B & B Wine Company which now produces and bottles their wine at Treasure Island Winery in San Francisco, California. Dusty Baker, best known as a former player and manager of the San Francisco Giants, Chicago Cubs, Cincinnati Reds, and the Washington Nationals, has carried his passion and desire for excellence from the baseball field to the winery. Dusty Baker has had an incredible 16 seasons in baseball playing with the Atlanta Braves, the Los Angeles Dodgers, the San Francisco Giants, and the Oakland A's. His record-setting career as a Major League Baseball manager is legendary and has earned him the "Manager of the Year" honors three times and has 1,800 managerial wins and counting. Dusty's combine efforts with Chik in establishing Baker Family Wines has given him great pride and he's looking forward to the future of producing more great wine for you to enjoy. In 1998, Chik graduated with a Master's degree from UC Davis's school of Viticulture and Enology, a school internationally respected for innovation in grape growing and winemaking. Upon graduation, he went to work for Amador Foothill Winery, in Amador County, CA. Chik went onto Terre Rouge Easton Winery, where he learned about making Rhone varieties. From there Chik worked as a Production Lab Manager at Woodbridge by Robert Mondavi and that is where he met Dusty. Today, Chik is the winemaker for the Department of Viticulture and Enology's at UC Davis. In his free time, he writes for Winemaker's Magazine (winemakermag.com). The magazine is popular with home winemakers. At Baker Family Wines, Chik ensures that every handcrafted wine we make is of the highest quality and will absolutely delight our customers.